Swiss bankers: One of the (many) great things about data is its ability to test tropes. At Swiss Info (the international service of the Swiss Broadcasting Corp.), Duc-Quang Nguyen wanted to answer the question “is Switzerland really the country of bankers?” He found that one in every 17 jobs in the Swiss workforce was in financial services, placing the country behind Singapore in terms of the dominance of the industry. But to his credit, Nguyen didn’t leave it there; he looked at metrics such as bank assets, contribution to gross domestic product and the market share of offshore banks — each of which led to a slightly different conclusion. The infamous Buzzfeed slidey thing, with data: Buzzfeed usually reserves its image slider for childhood photos (warning, weird link) or celebrity doppelgängers, but Tom Phillips deployed it on charts with great success. The polls for the Scottish independence referendum hadn’t yet opened when Phillips looked at the possible consequences of a “yes” vote; with his charts, you can see how the U.K.’s population, GDP, landmass, soft-drink consumption and Olympic performance would have changed had Scots chosen independence Thursday (they didn’t, 55 percent to 45 percent). 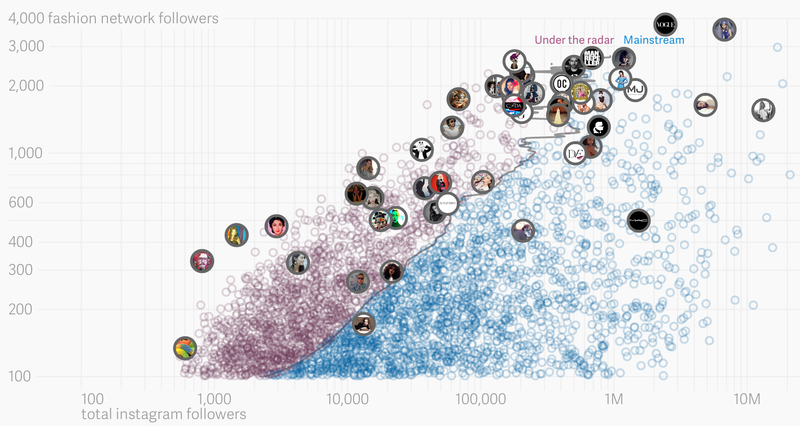 Fashionable data: David Yanofsky and Jenni Avins at Quartz started off observing the fashion industry’s love of Instagram and ended up analyzing 1.8 million accounts on the photo-sharing social network to “explore the hidden patterns of the fashion Instagram universe.” They picked 50 users from that universe and looked at whom those users followed. That yielded a network of 12,888 Instagram accounts, which they charted according to each account’s total number of followers and the number of followers who were in the fashion-industry network. No surprises about who’s at the top of the fashion pyramid: Queen B (Beyoncé). By contrast, athletes have plenty of “normal” followers but don’t get much love from the fashionistas.